RAS Reinhardt mdl. RAS 62.30 TURBObend PLUS CNC Electric Swivel Folding Machine s/n 25/7 w/ RAS System 5000 CNC Controls, 126” x 0.079” Cap., Controlled Back Gauging and Folding, Finger Brake Dies And Rack. 2008 Vicon Plasma Automation “Dual Twin Drive” 5’ x 10’ CNC Plasma Contour Machine w/ Vicon PC Based Controls, Innerlogic SR-45i Switching Regulator 45 Amp Plasma Power Supply, Pneumatic Pop-Up Sheet Locators. Wysong mdl. 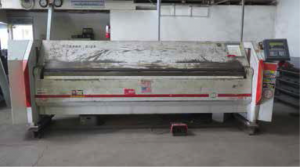 90-10 90 Ton x 12’ Press Brake s/n PB56-104 w/ Dial Back Gauge, 12’ Max Die Length, ¼”@ 5’, 3/16” @ 8’, 10GA @ 10’, 12GA @ 12’ Bending Cap., 3” Stroke, 4” Adjust, 8 3/16” Throat, 126” Between Uprights. DiAcro 48” Hydra-Power Press Brake w/ Dial Back Gage, 48” Bed Length, 25” Between Uprights. Strippit Custom 18-30 30-Ton ¼” Cap Fabricator Punch Press s/n 60792481 w/ Single and Nibble Modes, Fence System, Pinch Die Tooling and Cabinet. Wysong 10GA x 10’ Power Shear w/ Dial Back Gage, 80” Squaring Arm 25” Front Material Supports. Wysong mdl. 1636 16GA x 36” Kick Shear s/n F03-1381 w/ Manual Back Gauge. Pexto mdl. 299-C 20GA Circle Shear s/n 10/73 w/ 30” Throat, Stand. Chicago Size 10 10’ Folding Brake s/n 64126. Chicago mdl. S-412 48” Box and Pan Brake s/n 311694. Chicago mdl. BPO-414- 6 48” Finger Brake s/n 303380. Pexto 36” Bar Folder w/ Stand. Aircraft Pneumatic Hammer Former w/ Tooling. Erco Engineering and Research Corp mdl. 1447 Sheet Metal Shrinker s/n 852. DiAcro mdl. 1 6” x 6” Corner Notcher s/n 035107576. Custom Workstation w/ DiAcro No.1 6” x 6” Corner Notcher, Pexto mdl. 0581 20A Flanger. Excelsior No. 11 4 5/8” x 4 5/8” Corner Notcher s/n 4531D. Rotex mdl. 18-A 18-Station Turret Punch s/n 21127 w/ 2” Dia. Punch Cap, Stand. Whitney Jensen Kick Punch w/ Corner Rounding Dies, 11” Throat. DiAcro Punch No.2 Kick Punch s/n BB-2819 w/ 12 ½” Throat, Stand. 48” Hand Roll s/n B3043 w/ 3” Rolls. Tennsmith mdl. SR24 20GA x 36” Roll s/n 13164 w/ 2” Rolls. 36” Hand Roll w/ 2” Rolls, Stand. M-Power 12” Hand Roll w/ 1 3/8” Rolls. Lockformer 20GA 9-Roll Double Sided Roll Former s/n PL582. Lockformer 20GA 5-Roll Roll Former s/n 16274. Chicago No. 2 Universal Bender w/ Stand. Lockformer No. 24 24” Cheek Bender s/n 74. Lockformer Table Mounted “Easy Edger”. Pexto and Niagara Hand Beaders and Flangers. Table Model OBI Stamping Press. Tree Vertical Mill s/n 6J/V5B-300 w/ 1Hp Motor, 140-3500 RPM, 8-Speeds, Power Feeds, 10” x 42”Table. Morpol / Kama mdl. EV-996 7” Miter Horizontal Band Saw w/ 2-Speeds, Manual Clamping, Work Stop,Coolant, Conveyor. Lockformer 24” Vertical Band Saw w/ 20 ½” x 22” Table. Ingersoll Rand 15TE 15Hp Horizontal Air Compressor w/ 3-Stage Pump. Miller 330A/BP AC/DC Inert Gas Arc Welder s/n R388346 w/ Bernard Cooler. Miller Millermatic 250 CV-DC Arc Welding Power Source and Wire Feeder s/n KF953982. DuroDyne 48” Pin Spotter s/n 8170 w/ Bowl Feeder, DuroDyne Stud Welding Guns. Acme Type 1-24- 20 20kVA x 24” Spot Welder s/n 14472. Taylor Winfield 20kVA Spot Welder (NO ARMS). Miller Spectrum 375 “CutMate” DC Plasma Cutting System. Omark PowerMate 60SSD Stud Welder w/ Gun. 4’ x 8’ Steel Welding Table. Johnson No.101 Propane Fired Soldering Stations. Caterpillar GC20K 3400 Lb Cap LPG Forklift s/n AT82D00352 w/ 3-Stage Mast, 188” Lift Height, Side Shift, Cushion Tires, 3704 Metered Hours. Kynar Coated Multi-Colored Sheet Stock. Raw Materials Including Aluminum, Stainless and Galvanized Sheet.